Fast, easy, comfortable and affordable, now you can have the bright smile you've always wanted! Look younger and feel better in just 20 minutes! Dr. Weiss is now offering patients a unique opportunity for teeth whitening like no other before. Gone are the days of long dental visits and hit or miss results with traditional teeth whitening and teeth bleaching systems. No more painful bleaching methods or expensive procedures. No more hassle putting on whitening strips for your teeth every night. And the best part is, it's affordable! Unlike Zoom teeth whitening which is expensive, sometimes painful, and a major inconvenience for the patient, the new Sinsational Smile teeth patented procedure combines a special proprietary gel with LED technology resulting in a brighter smile and whiter teeth in less time at significantly reduced cost! Right now Dr. Weiss is offering the new Sinsational Smile whitening procedure to patients for only $99. Because the procedure only takes 20 minutes, many patients choose to get the teeth whitening performed directly after a teeth cleaning. Whitening durations vary from person to person. Certain food and drinks as well as other factors (i.e. tobacco, medications, age) can all affect the longevity of your results. 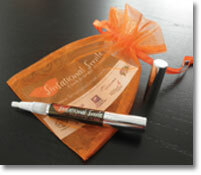 Results can last for up to one year, especially if between visits you continue to use the whitening pen. This easy to use pen can be used anywhere and takes only a couple of minutes help you keep your teeth looking their whitest. Teeth whitening is not for everyone. All whitening procedures work best on natural, healthy teeth and should not be used by people with poor oral health or anyone advised by their dentist not to have their teeth whitened. However, most people are good candidates for teeth whitening and do see substantial improvements in their teeth, even after one treatment. Aging, smoking and the ingestion of dark pigmented food and drink such as coffee, tea, cola and red wine are the leading cuases of tooth discoloration. This process will not whiten crowns, fillings, veneers or other dental work, the process does not adversely affect these structures.